A tribute to the capital’s alleys, ginnels and snickleways...Back, after a short rest. 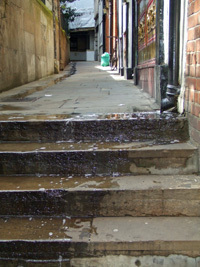 Part of a warren of similarly ancient thoroughfares in the Fleet Street area. As its name suggests, this one runs alongside St Bride's church, south of Fleet Street, and turns 90 degrees at the north-west to lead into the church. Looking something like an open sewer in our photo, this is actually quite a pleasant place. Hitch up over that wall, and you'll be in the churchyard, a quiet, contemplative space to sit. If you only visit one church this year, make it St Bride's. You don't need to be all gody or anything to appreciate the layers of history in this place. From the tiered spire, which influenced the first wedding cake, to the crypt, which houses a small musuem and significant Roman remains - this is one of those London spots that almost sweats with history (see picture). Did we mention that the first printing press was set up in the churhyard in 1501? And way, way before that, this was a place of ancient pagan worship. There's just too much for this one little column to cover. Do go and have a look some time. 1. Banksy spotting. There's a faded rat just out of shot to the left of this picture. 2. Entrance to the Old Bell pub (bit cluttered with suits, but one of the gems of Fleet Street).